Video demos of school dances! Spectacular lighting & video music! Start with experienced high school teacher and DJ Ryan Kellinghaus. Mix in the latest chart topping music for today's demanding students (with clean edits for conscientious parents and administrators). 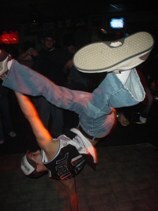 Throw in a professional breakdancing crew with Bboy Jaron. Then, add a high end digital Bose sound system, video screen and club lighting. Ryan has entertained with Jessica Simpson and played for the UC Bearcats at Fifth Third Bank Arena for three consecutive years! Planning a school dance is not easy. Parents, teachers and administrators want students to have fun but maintain good taste. Students want to hear today's music. We contract with the very same weekly music providors as major radio stations to ensure that we have the most current music libraries in radio edited format (edited for language). We also adhere to all "do not play" lists provided by the schools we work with. Hiring the wrong DJ for a school dance has lasting consequences... angry parents, poor student turnout, decreased fund-raising opportunity and poor moral. The right DJ can improve school spirit and help you develop a positive school culture. Request an estimate today and ask what we can do for your next school event. Bboy Jaron on channel 12! There are many things that set us apart from other DJ services but it's more than our DJs, music, audio equipment, lighting and video. We know that students want something different and we have to be on the cutting edge. This is why we offer an option with Bboy Jaron. Jaron and his crew pop, lock and breakdance. His excitement is contagious and schools have been raving about him. High school teacher Jerry Gels commented, "Students talked about Jarone for weeks. He was amazing. Students were forming circles and breakdancing with him. The dancefloor was packed. Students are already asking for another dance! I'll call you this week to lock in the date."